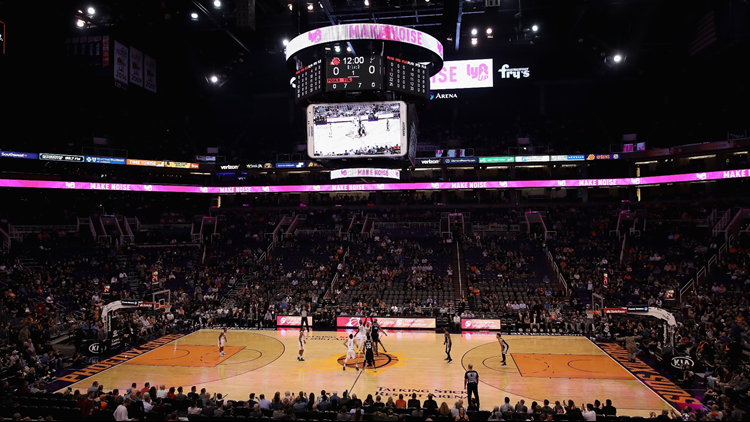 General view of action as the Phoenix Suns and the San Antonio Spurs tip-off during the first half of the NBA game at Talking Stick Resort Arena on November 14, 2018 in Phoenix, Arizona. Both supporters, and opponents, spoke passionately at the first of five scheduled public meetings. The first public meeting on the renovation of the Phoenix Suns' home Talking Stick Resort Arena certainly brought the heat. Residents gathered at Talking Stick Resort Arena in downtown Phoenix Saturday morning, eager to have their voices heard. “Without this arena, or the Suns here, we wouldn’t live here,” said one local resident who lives downtown. The passion was abounding in the first of five public meetings organized by the city. The City of Phoenix wants to spend $230 million dollars to renovate the arena they own. Supporters say the facility brings hundreds of millions of dollars in economic benefits in everything from tourism to jobs. They also worry about the impact to the often-bustling downtown area, if the Suns were to leave the arena behind. Those residents in favor of the spending think the renovations will benefit the city. “There’s no sense to me of not taking something that was the staple of the development of this area of downtown and doing away with it,” added a public commentator and Suns season ticket holder. The city argues that the money won’t come from residents, but rather a tourism tax. Opponents, however, wondered why the dollars can’t be spent elsewhere. “I see much more important infrastructure projects that this city needs to deal with,” said one opponent of the renovations plan. Opponents also questioned why the city should help prop a professional sports team that’s valued by Forbes at over $1 billion. “Stadium subsidies are, we think, are a very good example of government picking winners and losers in the private marketplace,” said one opponent. On the court, the team isn’t helping matters with their play. The Suns are currently on pace to finish at the very bottom of their conference standings for the fourth consecutive season. Multiple players attended Saturday’s meeting and General Manager James Jones told the crowd they “were available," but the athletes declined to comment when approached by 12 News. If the council doesn’t approve the money, the team could move to leave downtown in 2022— a threat Suns owner Robert Sarver has made public. The city council will decide by a vote on Jan. 23.